DHA is one of the good fats found throughout the body. It’s a structural fat that goes straight to the tissues such as those in the brain, to keep them functioning to the best of their ability. Just as calcium is essential for building strong bones, DHA ensures that the cells in the brain, retina, heart and other parts of the nervous system develop and function properly from infancy through adulthood. DHA accounts for up to 97% of the omega-3 fatty acids in the brain and 93% of the omega-3 fatty acids in the retina. It also plays a key role in the anti-inflammatory process, is a key component of the heart and is naturally found in breast milk. DHA is like brain nutrition, and the brain and eyes have significant requirements for preformed DHA. The body continually turns over DHA throughout the lifecycle and it is important to replenish the stores of DHA in our bodies. While the body can convert DHA from its precursor fatty acids, this process is inefficient and varies from person to person. Since our bodies don’t produce the DHA we need, we need to consume it through food, beverages or supplements. EPA is a key anti-inﬂammatory agent in the body. It does this by blocking the conversion of Omega-6 derivative Arachidonic Acid into highly inﬂammatory compounds. In other words, it blocks inﬂammation from taking place even if you’ve been eating an Omega-6 rich diet. Researchers believe the optimal ratio of omega-6 to omega-3 is somewhere between 2:1 and 4:1. Yet the typical American diet provides a ratio of anywhere between 10:1 and 30:1, meaning most of the population is deficient in omega-3. 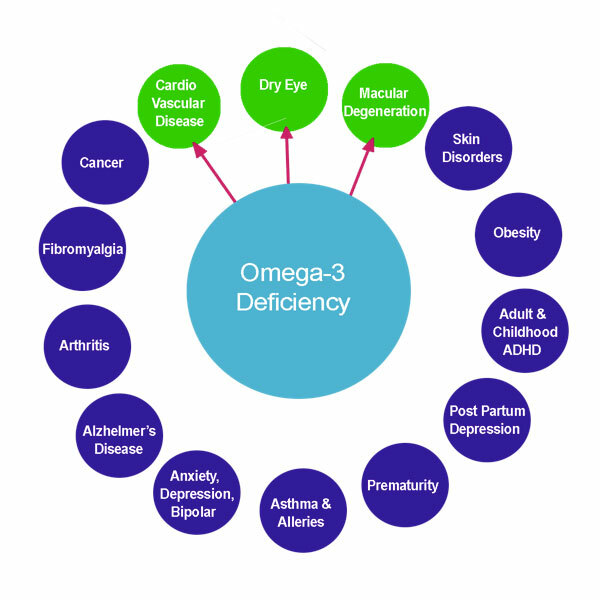 EFA deficiency and omega-6 and omega-3 imbalances have been linked to serious health conditions, such as heart attacks, cancer, insulin resistance, asthma, depression, accelerated aging, stroke, obesity, diabetes, arthritis, ADHD, and Alzheimer's disease, among others. Researchers have found that the ratio of omega-6:omega-3 in the diet is important to health and have concluded that the ideal ratio is tied to the type of condition and its severity. Modern western diets that include high amounts of carbohydrates particularly related to high intake of refined carbohydrates have created a dramatic imbalance in the omega-6:omega-3 fatty acid balance thought to result in a greater increase in chronic inflammatory health conditions. Excessive amounts of omega-6 are connected to heart disease, autoimmune conditions, cancers, and diseases involving inflammation such as arthritis. Higher proportions of omega-3 are tied to reductions in heart disease, autoimmune and inflammatory condtions and cancer. A ratio of 4:1 was found to lower heart disease deaths. A ratio of 2.5:1 was found to combat colorectal cancer, while a proportion of 4:1 had no effect. Similarly a lower proportion of omega-6:omega-3 was connected to decreased risk of breast cancer. They are an integral part of cell membranes throughout the body and affect the function of the cell receptors in these membranes. They provide the starting point for making hormones that regulate blood clotting, contraction and relaxation of artery walls, and inflammation. They also bind to receptors in cells that regulate genetic function. Likely due to these effects, omega-3 fats have been shown to help prevent heart disease and stroke, may help control lupus, eczema, and rheumatoid arthritis, and may play protective roles in cancer and other conditions. Another important function of polyunsaturated fatty acids containing 20 carbon atoms (C20) and particularly arachidonic acid (omega-6) and eicosapentaenoic acid (omega-3) is that they can be converted to locally functioning transmitter substances. Among these transmitter substances, prostaglandins and leukotrienes are the best studied. These transmitters are involved in inflammation. reducing levels of omega-6 relative to beneficial omega-3 fatty acids. omega-3 fatty acids from fish oil result in a more rapid uptake into plasma triglyceride and platelet phospholipids, which specifically benefit the cardiovascular system. Neuroprotective effects are important for the prevention of age-related brain shrinkage (cortical atrophy). Aging adults with brain shrinkage often experience memory loss, cognitive decline, and an increase in depression. Studies show that people with higher levels of omega-3 fatty acids in their blood experience brain benefits such as better cognitive outcomes, larger gray matter volume for their age, fewer signs of brain blood flow disturbances, and lower rates of dementia, compared with those having lower omega-3 fatty acid levels. Those with lower DHA levels have poorer scores on cognitive testing, smaller brain volumes, and more "white matter hyperintensity"
(also called leukoaraiosis), a condition that is associated with accelerated brain aging. One important way omega-3 fatty acids protect your brain is by shielding the chief memory processing area of your brain, the hippocampus. Studies show that people with lower total omega-3 levels have smaller hippocampus volumes. Diabetes is a key factor in accelerated brain aging. Neuroprotective and cognition-improving effects have been shown in diabetic animals when they were supplemented with omega-3. Omega-3s are also credited with slowing the rate of cognitive decline in patients with very mild early Alzheimer's disease. Studies supports regular supplementation with omega-3 oils as a means of lowering long-term cardiovascular risk. This may be due to omega-3 fatty acids' effects on reducing inflammation, lowering triglycerides, reducing blood pressure, improving endothelial function, inducing new blood vessel formation after heart attack or stroke, and favourable modification of obesity-related inflammatory molecules. medications to mitigate infection and inflammation of the eyelids and also to possibly improve the lipid profile of the glands. Omega-3 fatty acids have been shown to decrease inflammation, stimulate tear production and thin meibomian gland secretions. Dry eye patients need 2,000mg of omega-3 supplements per day. "The dietary ratio of Omega-6 to Omega-3 should be from 2:1 to 4:1." However, like most treatment options, the most important factor in effective omega-3 supplementation is your compliance. Fatty acids are the building blocks of dietary fats. The human body stores such dietary fats mainly in the form of triglycerides. Triglycerides containing omega-3 fatty acids are mainly found in fish. The bulk of fat contained in our diet are the triglycerides. The triglycerides contain three fatty acids, saturated and the two unsaturated fatty acids, DHA and EPA. Fats with a high content of saturated fatty acids are solid at room temperature, butter and fat from red meat, for example. Fats with a high content of unsaturated fatty acids are soft or liquid at room temperature, for instance, soft margarine, plant oils and fish oil. The terms saturated and unsaturated refer to the chemical structure of the fatty acids. Unsaturated fatty acids have one or several double bonds. In omega-3 fatty acids, the double bonds start at the third carbon atom counted from the Omega end. In omega-6 fatty acids, the double bonds start at the sixth carbon atom. Although animals and humans are not able to produce them naturally, polyunsaturated fatty acids are essential for normal life functions. They are therefore characterized as essential fatty acids. Polyunsaturated fatty acids are produced by various plants. They reach man through the food chain, either directly through the consumption of fruit and vegetables, or by eating the flesh or eggs of animals, birds or fish that have eaten plants containing the polyunsaturated fatty acids. Essential polyunsaturated fatty acids can be classified as belonging to one of two "families", the omega-6 family or the omega-3 family. Fatty acids belonging to these two families differ not only in their chemistry, but also in their natural occurrence and biological function. Omega-6 fatty acids are typical of the polyunsaturated fatty acids found in terrestrial plants and they will be present in that part of the food chain. Omega-6 oils are found in cooking oils such as corn oil and soybean oil. Omega-3, on the other hand, is produced by marine plankton and is heavily represented in the marine food chain. The most important source is fat fish. While the recommended daily intake of marine omega-3 fatty acids should be in the range 0.6 - 1 gram per day, a "normal" diet in the Western world only satisfies about 10-15% of this requirement. The remaining requirement, the "nutritional gap", can be covered by increasing one's consumption of fatty fish or by using suitable dietary supplements. Indeed, an imbalance in this ratio causes inflammation—which can be discussed in terms of compromised joint health, heart health, and the immune system. Polyunsaturated fatty acids play a central role in the cell membrane, the "wall" surrounding all living cells. The composition and structure of the cell membrane is very important for maintaining normal cell function. All nutrients and waste substances have to be transported through the cell membrane. The same happens to biological products produced by the cells, i.e. hormones or other substances used by other cells in the body. Another important function of polyunsaturated fatty acids is that they are vital components of brain tissue and other nerves. The omega-3 fatty acid, docosahexaenoic acid (DHA), is particularly important. A normal adult brain contains more than 20 grams of DHA! Emerging research suggests that different sources of omega-3 fatty acids, such as fish oil and krill oil, provide complementary effects upon cellular targets throughout the body.The result is enhanced support for cardiovascular health and the brain due to the different ways that fish oil and krill oil are taken up by our cells. When combined, krill and fish oil appear to offer enhanced benefits for both the cardiovascular and nervous system than either form by itself. In comparison, the omega-3s found in krill appear to be more rapidly incorporated into red blood cell phospholipids. Additional research suggests that when omega-3 fatty acids such as DHA are bound to phospholipids as they are with krill, it increases their uptake to the brain which suggests ingestion of phospholipid-bound EPA and DHA increase cognitive function scores to a greater degree compared with scores obtained when the fatty acids in the ingested oil were provided in the triglycerides storage form. Both omega-3 fatty acids DHA and EPA are well known to provide systemic benefits throughout the body and reduce the risk of early death. DHA is vital for early brain development and maintenance, while EPA seems to be closely related to behavior and mood. Together, both molecules provide critical neuroprotective benefits. These neuroprotective effects are important for the prevention of age-related brain shrinkage (cortical atrophy). Aging adults with brain shrinkage often experience memory loss, cognitive decline, and an increase in depression. •	Taking 4 grams per day of a prescription EPA supplement led to marked reductions in plasma triglyceride levels, especially in people with very high levels; reductions of 33 to 45% have been reported. •	Similarly, 4 grams per day of prescription EPA led to significant reduction in triglycerides and other dangerous lipids in people already on statin-type lipid-lowering medications. •	Taking 4 grams per day of prescription EPA led to significant reduction in oxidized LDL-cholesterol and C-reactive protein (CRP), measures of oxidation and inflammation, respectively. •	In patients with cardiac complications from metabolic syndrome, taking 1,440 mg/day of omega-3 fatty acid supplements led to improvements in endothelial function, including improved blood flow resulting in vessel dilation. •	Taking 520 mg/day of DHA and 120 mg/day of EPA led to decreased platelet aggregation (clot-forming).In obese adults, 4 grams per day of a 46% EPA, 38% DHA supplement, and diet changes led to increases in both large and small artery elasticity. Omega-3s from fish oil, eicosapantaeonic acid (EPA) and docosahexaenoic acid (DHA) come to consumers in one of two forms: triglycerides or ethyl esters. One of the most controversial and debated quality issues surrounding fish oil is which form of fish oil is best Triglyceride (TG) or Ethyl Ester (EE)? What form are the long-chain omega-3 fatty acids (EPA and DHA) in when we absorb them from eating fish? The answer is triglyceride. Over 98% of all fats ingested are in triglyceride form. Ethyl ester forms of omega-3 fatty acid supplements are becoming more prevalent in the market because of the cost: they are cheaper to produce than triglyceride forms. The industry created ethyl ester because they are a more malleable form than triglycerides. They have a much higher boiling point, and are easier to work with when processing for supplement distribution. The main purpose of molecular distillation is to remove the industrial contaminants (e.g., heavy metals, dioxins, and PCBs) present in the commodity fish oils most supplement makers use, and concentrate the omega-3 molecules, EPA and DHA. In this model sterility overshadows efficacy. Studies have shown that ethyl esters are the least bio-available forms of omega-3 s compared to TG forms and/or whole fish. Once purification is complete through the micro distillation process why would the manufacturer leave them in an EE form? Ethyl esters are produced by reacting crude fish oil in a free fatty acid form with ethanol (an industrial alcohol) to form a synthetic substrate. Under a vacuum, the mix is then heat distilled and the resulting condensate is a concentrated omega-3 ethyl ester solution. The concentration of the omega-3 fatty acid depends on the variables of the distillation process but normally results in a 50-70% omega-3 solution. While in the EE form, the glycerol backbone is missing. Therefore, the fatty acids will find an available triglyceride backbone or take one from an existing molecule. If the latter occurs, the molecule missing the backbone will look for another backbone, and so on, creating a domino effect. The free fatty acids are taken up by the enterocytes (gut epithelium) and must be reconverted to TGs to be transported in the blood. (3) Fats are stored and transported in the body in triglyceride form. Research shows that after ingestion of an omega-3 fatty acid molecule in triglyceride form, the fatty acids are cut from the glycerol backbone, then the backbone and fatty acids are absorbed via the gut epithelial cells and immediately reattached to form the natural triglyceride. This is supported by our own understanding of human physiology: when ethyl esters are consumed, they are processed in the liver, where the ethanol is drawn off, and the body must then rebuild the resulting free fatty acids back into a triglyceride. The EEs that get digested produce free fatty acids plus ethanol. This is certainly a less efficient absorption process compared with the direct intake of a natural form triglyceride because the EE form must be reconverted in the body back to a TG form. The delay in TG re-synthesis suggests that transport to the blood is more efficient in natural TG fish oils in comparison to EE. A bioavailability of different omega-3 formulations was reported by Dyerberg (the father of fish oil). Seventy-two healthy subjects were allocated to be given a reesterified TG, EE free fatty acid, fish oil or cod liver oil preparation for two weeks. The concentration of EPA and DHA was highest in the re-esterified TG group and lowest in the cod liver oil group. A similar study also concluded that only 20 percent of the omega-3s in the standard ethyl ester from were absorbed, unless they were taken with a high-fat meal, which raised the absorption level three-fold, to 60 percent. (10) In contrast, the absorption of other fish derived omega-3s (EPA and DHA) in their natural triglyceride from was substantially greater in either context (high fat or low fat): absorption of DHA was equally superior with either low-fat meals or high-fat meals, while participants absorption of EPA increased from an already-high 69 percent to 90 percent when taken with a high-fat meal. Evidence suggests that triglyceride (TG) fish oils are better absorbed in comparison to EEs. Natural TG fish oil results in 50% more plasma EPA and DHA after absorption in comparison to EE oils, TG forms of EPA and DHA were shown to be 48% and 36% better absorbed than EE forms, EPA incorporation into plasma lipids was found to be considerably smaller and took longer when administered as an EE. Omega-3 fish oils in the form of EEs are much less stable than those in the natural TG form and readily oxidize. The oxidation kinetics of DHA as an EE or as a TG was assessed by measuring the concentration of oxygen found in the head space of a reaction vessel with both TG and EE forms. The EE form of DHA was more reactive, and quickly oxidized, demonstrating that EE fish oils are far less stable and more readily product harmful oxidation products. Furthermore, the stability of oil containing DHA in phospholipid triglyceride, and EE form has been assessed. After a 10-week oxidation period, the EE DHA oil decayed 33% more rapidly. The most common side effects: burping (thus the need for enteric coating), infection, flu symptoms, upset stomach, a change in your sense of taste, back pain, and skin rash. Indeed, the impact of ethanol release from ethyl ester forms of fish oil can be documented under the adverse events section in the prescribing information for Lovaza, the EE prescription form of fish oil. Some of these adverse events include body odor, vomiting, gastrointestinal disorder, pancreatitis, cardiac impact and hypertriglyceridemia (which is paradoxically the clinical issue for which this drug is prescribed). All of these side effects are a result of the toxicity of the ethanol released form this highly concentrated EE form. Almost all clinical evidence showing Omega-3 benefits relate to fish consumption. Fish are in a TG form. There are NO ethyl ester fish in nature. Humans must consume fish oil in the same form as the fish to receive the maximum benefits. Ethyl esters have been in the human food chain approximately 20 years. Triglyceride fatty acids have been eaten safely, and for great benefit, for an estimated 600 million years. Diet alteration and supplementation with Omega-3 work . Because patients with MGD have an altered lipid composition, changing the dietary lipid intake affect the lipid composition of the meibomian glands. As such, omega-3 supplements are recommended as a treatment for dry eye and MGD. The benefit seems to be more marked in conditions such as blepharitis and gland disease Oral omega-3 fatty acids are beneficial in the treatment of MGD, mainly by improving tear stability. There is also recent evidence that omega-3 consumption may significantly reduce certain conjunctival inflammatory markers. The omega-3 fatty acids, particularly DHA, are found in high concentrations in the retina where they are important structural components of photoreceptors. The critical role of DHA in normal retinal function is well documented and it is therefore suggested that dietary intakes may protect against age-related macular degeneration (AMD). Long-chain omega-3 fatty acids, predominantly found in oily fish, may also protect against oxidative damage, and help modulate retinal cell gene expression, cellular differentiation and cellular survival The critical role of DHA in normal retinal function is well documented in humans where it appears to influence cell membrane integrity and permeability, modulates the activity of enzymes and receptors on the membrane, and acts as a precursor for the synthesis of other important biological molecules. Observational studies support the hypothesis that omega-3 poly-unsaturated fatty acids (PUFA) are protective in the eye. A 2008 meta-analysis of epidemiological studies reported that a high intake of omega-3 fatty acids and fish intake at least twice a week may reduce the primary risk of both early and late AMD by up to 38% . In a 5-year follow-up study of the Blue Mountains Eye Study cohort, fish consumption at least once a week was associated with a 40% reduction in incident early age-related macular degeneration, and more frequent consumption of fish (3 times a week) was found to be protective against late ARM . Other studies have found similar findings . Some prospective studies also reveal a decreased likeliness of AMD progression in those with early AMD . It is important to note that in these studies, positive correlations involving the risk or progression of AMD were only seen in subjects who had a low dietary intake of omega-6 fatty acids. These findings support similar evidence found in other cohort studies highlighting the importance of maintaining a healthy ratio between these two essential fatty acids in the diet .